REMEMBER! If you have a registered disability, you don't pay the VAT. The Zoom four wheel rollator with its stylish lightweight aluminium frame and easy folding mechanism is suitable for both outdoor and indoor use. 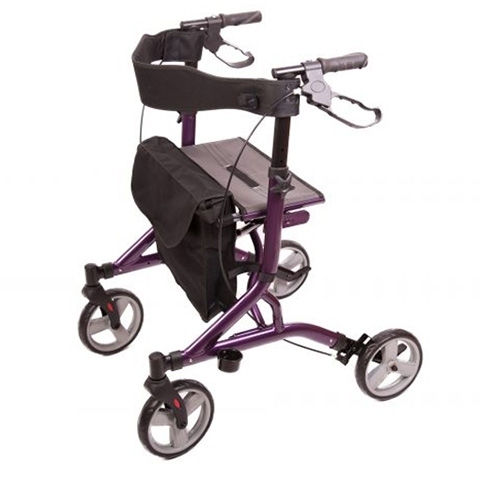 Quick release wheels enables the rollator to fold down to a very compact size for storage and the wide backrest and seat offers great comfort and back support. Incredibly light and easy to handle. Large storage bag with locking clip. Quick release wheels enables rollator to fold down to a very compact size for storage or transport. Stylish and contemporary looks and design.